Previously I have found it to be pretty straight forward to default the picker control to things like the current user just via the control settings. But what if you want to set this to another property, such as the current user’s manager? This is exactly what I wanted to do on a few of our internal forms during the process of moving from InfoPath to Nintex Forms. I will be assuming that you have a basic knowledge of how to design a form in Nintex Forms so I will be skipping the simple stuff. In my example I was creating a basic leave form that contained fields for the Employee Name, Leave Type, Start Date, End Date and Manager. For SPServices to be compatible with this convention it is necessary to make a minor modification to the library. 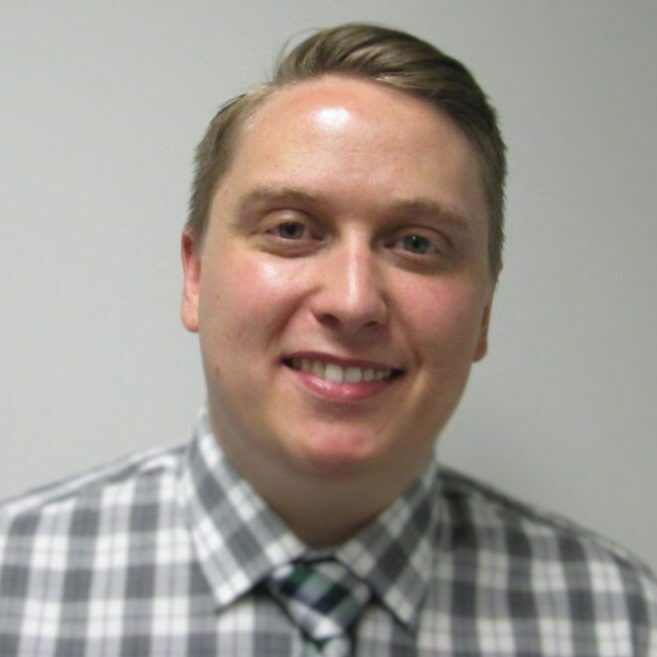 There is a good blog post that covers this off pretty well, written by Chris Kent (http://thechriskent.com/2013/08/08/use-spservices-in-nintex-forms-2010/). I would suggest following this or you can simply download the one I prepared earlier in the zip provided at the end of this post. Below is a screenshot of what my library looked like after uploading these files, yours should look similar. Note down the URL to each file, we will need to include these in our form. 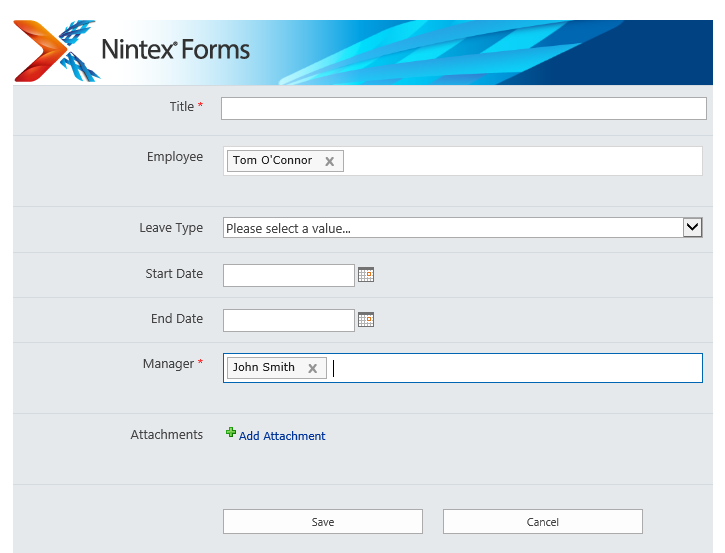 Return to your list, from the ribbon click the Nintex Forms button to open the Form Designer. 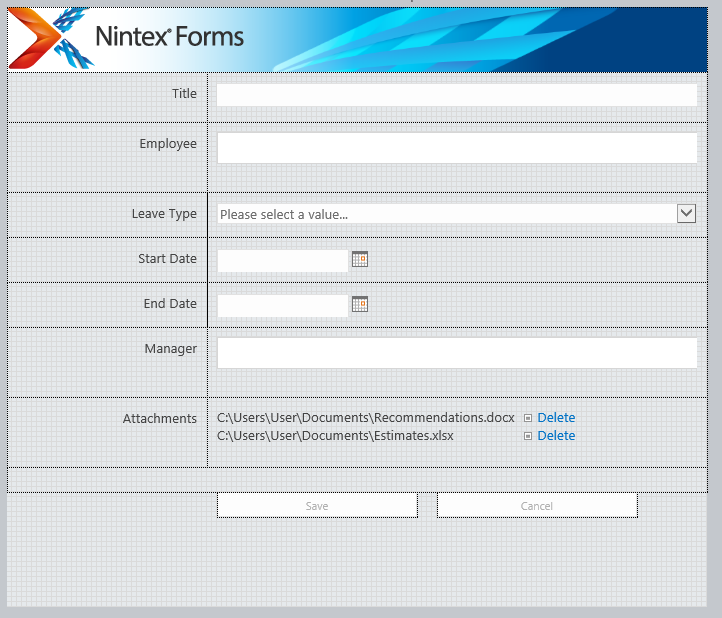 As you can see below, Nintex Forms did a pretty good job with auto generating the initial form template. To interact with the people field it is easiest if we give it its own CSS class name. In my form I creatively called this ‘manager-control’ but this can be called whatever makes the most sense to you. To update the field, right click on the people picker control and select Settings. Under the Formatting section add the additional CSS class as shown in the dialog below. Note that this class name is referenced in the FillPeoplePicker.js. If you use a different CSS class it will be necessary to update this code. The order that you specify the files here is likely to be important due to dependencies, I would suggest including the files in the order shown below. Tom, do you know if this works for the Nintex 2010 products? Hi Tim, Not 100% sure, I can give it a shot though in my development environment and let you know how it goes. Just tested this out and the exact same instructions are working on the SP2010 version of Nintex Forms. Employee Name and Manger are both set as people picker? Employee Name set as current user? If so, it does not work. I don’t know why it is always “No Items Found” in the manager field. Do I need to have to do the synchronization of the user profile services? 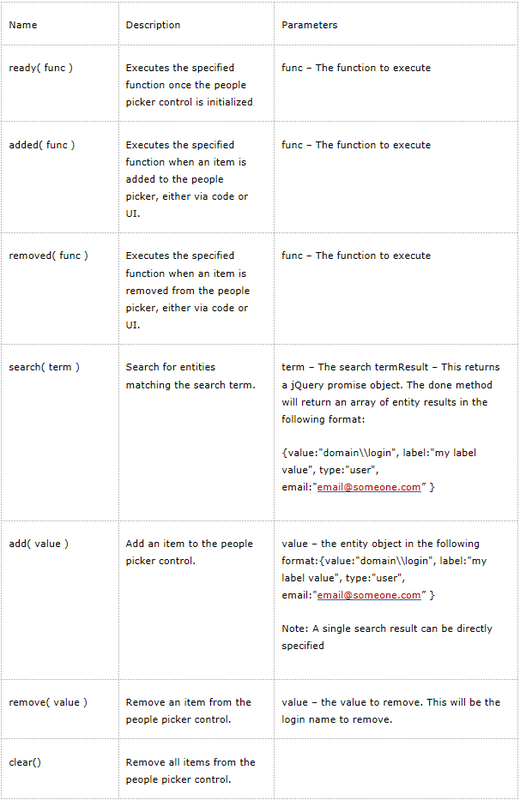 The value is retrieved from the user profile in the user profile service. It would be worth checking that the manager field has been populated here. HI there, thanks for article, does this only work with Forms 2013? I have tried it with Nintex Forms O365 version and get no joy. Hi Nigel, I haven’t tested this myself. I imagine the people picker control is probably different on Office 365 in the way it functions which is probably why you are seeing issues. “We have finished in our investigation regarding NF.PeoplePickerAPI in O365. As you have said this works for the Nintex forms 2010. I am not able to get it working for nintex forms 2010. I am having site collection admin rights. It is giving me error in console for SPGetCurrentUser. Also the order of scripts is correct. Do i need to seperatly reference jqyery 1.10.1 min version to work your spuserservice. Also if this works i have to achieve selected employees manger. I have a form where in i have to select the employee from people picker and on blur of employee name the manager name should populate automatically,. What do i need to do different in my case. You shouldn’t need to reference jQuery, you should be able to just use the built in Nintex Forms version. You will have to reference SPServices though. If you hard code the username does it return the users manager? It is now working as you have described. There was issue with the claims authentication mode it was appending claim token like i:0#.w| which might be one reason also the spservices were not working may be due to the file path name ,so nothing was getting loaded. Now everything is working fine as you had described in your article. Can you please help me to handle onblur event of the people picker since on blur of people picker(employee) i would like to populate the other people picker (manager name). I was referring to other article of your and i found Added event should fix my issue. Instead of using onblur event we have added event which will help to poplulate the manager. but i am not able to get the value of the user from the people picker. Can you please provide detail on how to read the extended people pikers selected values from Added event. I tried doing the below but it’s not working. Nothing works for me. Can you please provide how to access the selected person login id. I am following your direction , but still I can ‘t seem to get the form to populate it with the Manager’s name. I am using Nintex for O365. I don’t get any errors in the F12 Developer Tools either, so not sure what I am missing here. Hi Suolon, That sounds like an issue with SPServices not being included properly. Perhaps check that you have included this library with your form. Hi Tom, It seems that this is a problem with Nintex for Office 365 actually. Have you tried to see if this works for Office 365? Thanks for the guy Tom nice work, if only the new lookupUserProfile could populate a PP. One addition I would add in the filler would be to check if it contains any data already, and if so do nothing. This allows for instances when Editing a form rather than New, and as such it won’t add another manager in. Thanks Warwick, and good point with the Edit Form. Thanks for this as it worked exactly how I needed it to first time. This seems like a problem with the reference to SPServices, I’d suggest checking this. How were you linking this up currently? Tom – Thank you for this article. I’ve used it quite a bit in various forms. Question on Step 3, regarding the FillPeoplePicker script. How would I modify it to update the control only if the control was blank? I’ve come across a situation where my form also contains a couple cascading lookup fields. When any of the lookup fields are populated/set, the Nintex form refreshes. This causes the PeoplePicker field to add the manager-control value again. Thus I get “Smith, Joe” twice in the field, therefore getting the PeoplePicker message “You are only allowed to enter one item”. 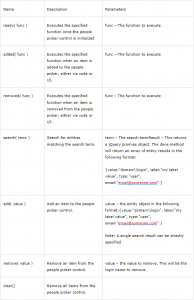 I’m sure the change to the script is rather simple, but I’m a novice at jQuery and especially how the syntax integrates with Nintex. jquery.js?rev=wUPlnhwFqtWad8lD53Aazg%3D%3D:551 [Deprecation] Synchronous XMLHttpRequest on the main thread is deprecated because of its detrimental effects to the end user’s experience. For more help, check https://xhr.spec.whatwg.org/.